We've all had bad experiences with rogue drivers, of the truck and car variety... that's where the Share the Road highway safety program comes in. 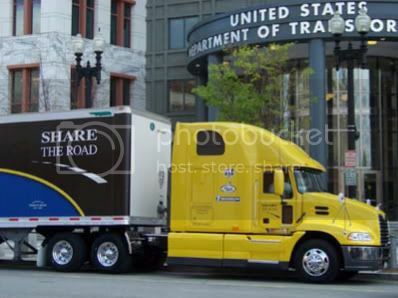 Share the Road is a highway safety initiative created by the American Truck Association, that uses multiple communication channels to educate both car and truck drivers on how to safely... you guessed it.. "share the road." Today, Mack Trucks signed up for another year as one of two primary sponsors of the program, and is again donating a branded model truck to help spread the message. Share the Road uses professional truck drivers to deliver life-saving messages about potential blind spots, safe following distances, truck stopping distances and other important topics, but it's how they're doing it that makes this opportunity interesting. The drivers spread this information through demonstrations to local media, students, community leaders and highway users around the United States, using a SmartWay-certified MACK Pinnacle model tractor donated by the truck maker as part of its support of Share the Road and they're also branching into social media channels such as flickr, Twitter, YouTube and facebook. Other Share the Road sponsors include Michelin, Pre-Pass, Freight Wing and General Electric. Let's hope, for everyone's sake, that this is a sponsorship that makes ROI.